Turtle Power! Midco Toys has partnered with toy company Flair to exclusively release a special series of Teenage Mutant Ninja Turtles 4” scale Classic Collection action figures in the UK. The range will include Donatello, Leonardo, Raphael and Michelangelo along with Splinter and Shredder. 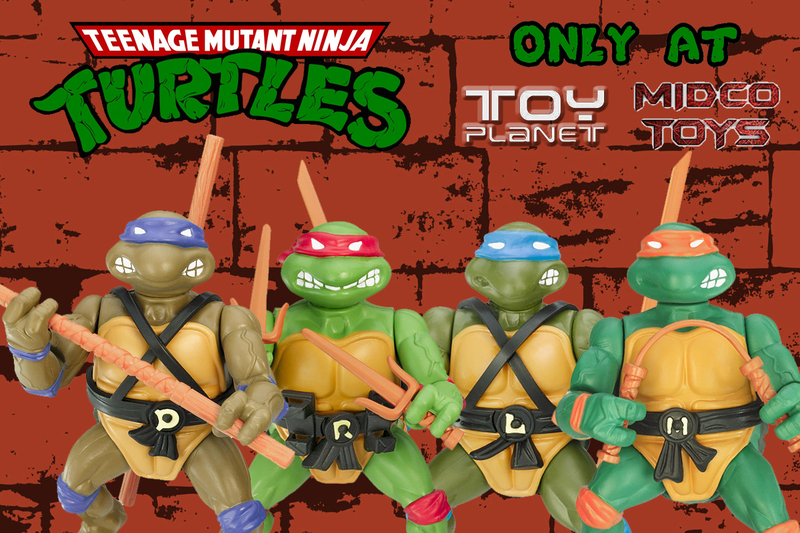 Each figure is based on the original 1988 release, using the original Playmates moulds for totally radical authenticity. Each figure comes with their core Ninja weapons and an extra weapons rack. In anticipation of their release in June, Midco Toys will be offering pre-orders on the action figures to guarantee that customers receive them on the official release date. Launch activity will include a Twitter campaign and a Pizza Partyyyy! – with more details to follow. Anne-Marie Noon, Marketing Manager, Flair added: “Midco Toys is the perfect partner for us to bring these classic action figures to the legions of Turtles fans in the UK. As a specialist retailer the team at Midco knows what its customers want and aims to deliver both on the sales and retailer experience sides. It has been 26 years since the original release of this classic series and we expect them to be in huge demand”. The Teenage Mutant Ninja Turtles Classic Collection perfectly complements the mix of products sold at Midco Toys, with its dual appeal of collector-friendly nostalgia and being a hot property with children. The Classic Collection will form the centrepiece in a full range of Teenage Mutant Ninja Turtles products, including action figures, playsets, role play, creative and electronic toys. Toy Planet is based in Derby’s Westfield Centre, and is one of the launch shops from when it re-opened in 2007. It sells a wide range of toys for all ages, including specialist items not commonly stocked. Midco Toymaster is Burton-on-Trent’s only dedicated toy shop. It sells a wide range of toys for all ages, including specialist items not commonly stocked.